An important part of integrating with the Ubuntu desktop is ensuring that your application is using all of the appropriate indicators. 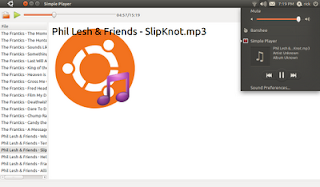 In this entry, I explain how I added support for the Ubuntu Sound Menu to the sample application "Simple Player." 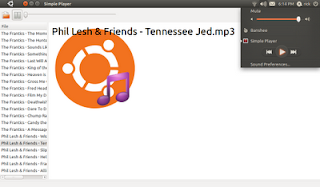 Create a Desktop File so the Sound Menu knows that it should display your application. Add sound_menu.py to your application, instantiate a SoundMenuControls object, and start a dbus main loop. Implement functions from the SoundMenuControls so that the Sound Menu can control your application. Call functions on the SoundMenuControls objet so that the Sound Menu knows about changes that your applications makes. If you are developing an application, and have not installed it, most likely you do not have a desktop file installed. Desktop files are used in Linux desktops to describe your application to the system. Many parts of the desktop refer to desktop files for things like creating application launchers and menus, file handling support, etc... 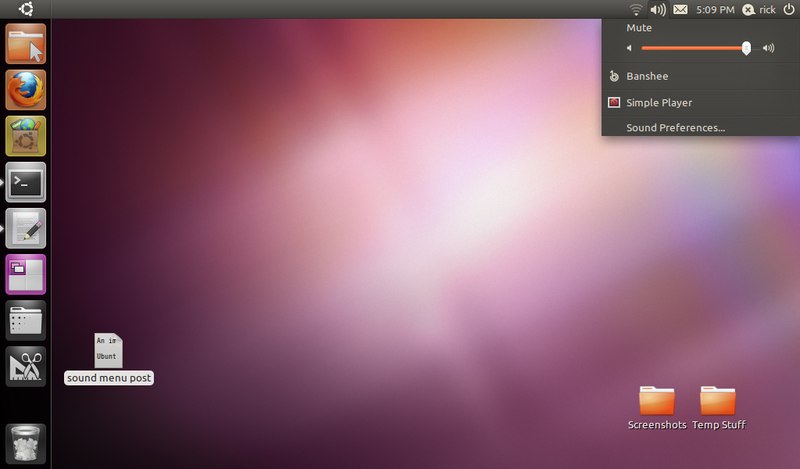 The Ubuntu Sound Menu uses desktopfiles to determine which applications it should launch and handle. In a default Natty install, only Banshee will have a desktop file that the Sound Menu will detect and want to handle. Desktop files all live in /usr/share/applications/. A quickly project has a file called app-name.desktop.in. This file will be turned into a real desktop file by the packaging and installation system. But it won't work for development, so you'll want to create a new one and copy it into /usr/share/applications/. to copy it into the applications directory where the Sound Menu could find it. Then I logged out and logged in again so that the Sound Menu could discover it. Now Simple Player shows up as an option in the Sound Menu! There is no icon, because I have not installed the icon for Sound Menu. Also, clicking the Simple Player menu item won't launch Simple Player because the application is not actually installed. Both of those problems will be fixed when the application is properly packaged and installed. 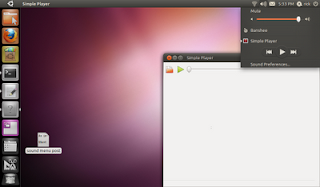 The Sound Menu communicates with applications via the MPRIS2 DBUS API. This was a good choice by the Sound Menu developers because many applications already support MPRIS2. However, doing DBUS programming, especially with Python, can be a tad complex. Since I didn't want application programmers to have to rewrite all the DBUS code every time someone wants to integrate a Python application with the Sound Menu, I create a module called sound_menu.py to encapsulate all the DBUS goo. 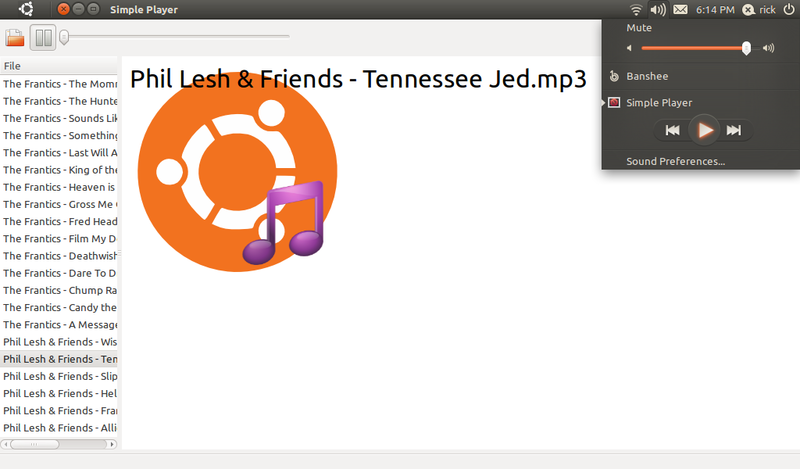 Note that sound_menu.py does not implement all of the MPRIS2 specification, only the parts that the Sound Menu needs. This will create a directory called sound_menu, with a single file sound_menu.py. If you want to, you can look at sound_menu.py and copy and paste the code into your program to make it work. However, sound_menu.py is designed so that you can easily mix it into your application without having to modify it, or work with the DBUS calls directly. We'll go that route for Simple Player. Now that the sound_menu module is copied into the applications library, there are a few steps to take before you can really start programming it. # Support for command line options. See helpers.py to add more. Using "$quickly run" to start simple-player, notice that the Sound Menu now knows that it is running, and presents the Controls for it. If you click on the different buttons and such, though, you'll notice that sadly they don't work. Well, why would they? The Sound Menu doesn't know how to make Simple Player do what it wants. In order to do that, we need to implement a few functions, and tell the SoundMenuControls object to use those functions. Then we'll need to add a little bit of code to inform the Sound Menu when changes occur in Simple Player too. All of the functions that you need to implement start with "_sound_menu_*". I named them this way so that it was obvious what the functions were for, and also so that they weren't likely to conflict with any code that you already wrote. There are 2 different approaches that you can take to implement SoundMenuControls's functionality in your application. You can inherit from it, typically by using multiple inheritance, or you can assign functions to the _sound_menu_* functions. This later method, though while not quite as clean, is a bit easier, so I went with that. The first thing I did was create local implementations of the necessary functions. Note that I could have named them whatever I wanted, but I decided to just stick with the names from SoundMenuControls. There are 6 functions that must be implemented. I added te following functions directly below the finish_initializing function. I think between the names and the comments, they are pretty self-explanatory, so I won't cover each one. """return True if the player is currently playing, otherwise, False"""
"""go to the next song in the list"""
"""go to the previous song in the list"""
"""raise the window to the top of the z-order"""
Note that the _sound_menu_is_playing function and the _sound_menu_pause functions both work by checking the state of the player's playbin. This requires a comparison to an enum in gstreamer. This won't work unless you import gstreamers, so remember to add "import gst" to your import statements. Now the Play/Pause button works, and the song title stays in sync as we make changes. But it's still possible for Simple Player and the Sound Menu to get out of sync. If I pause the song in Simple Player, and then use the Sound Menu, notice that the Sound Menu still thinks the song is playing because Simple Player never told the Sound Menu that the user paused it. You may recall when building Simple Player that it was easy to get access the controls for the MediaPlayerBox. So, to finish off the integration, we'll connect to the signal handler for that button, and then tell the Sound Menu when it's been used. Now the Sound Menu and Simple Player stay in perfect sync! New in Natty, the Sound Menu also includes support for playlists. I'm planning to add SoundMenuPlaylists as another class i the sound_menu module. In this way, applicatins such as Simple Player that don't have playlists can just implement the controls part. But other applications could implement the Playlist functionality. Awesome posts on ubuntu sound menu integration. Other sources of documentation and examples on it so far haven't been great. It works perfect, thanks a lot! 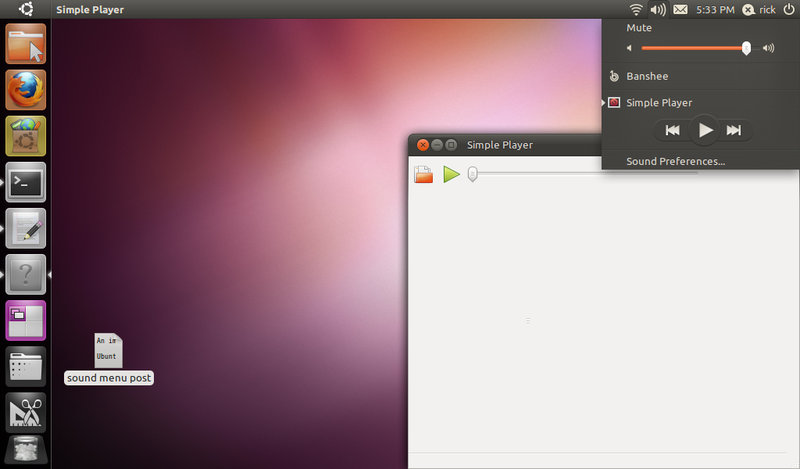 But in Ubuntu Unity 14.04+ the player is grey out after click on it. Any idea about that issue? I saw it in pithon by example. I filled this bug, any help is preciate! Thanks!